If you’re organizing a festival, there’s one thing you can be sure about: people will tweet about it. Everywhere and all the time. During the festival, they will share pictures of themselves, great artists and delicious hamburgers. By displaying those tweets live on a screen, you can make the festival experience even more memorable. Waiting for the artist to enter the stage is generally a dull moment. This is the perfect time to offer the public some entertainment. A Twitter Wall can do that. A big screen with funny tweets will keep festival-goers entertained, and stimulate them to also share their experiences. As the audience tweets, tweets and tweets, they generate a social buzz. The Twittersphere will be exploding with tweets about your event. 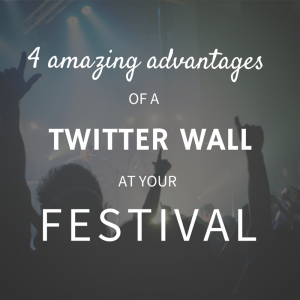 Your festival or concert hashtag might even go viral because of the Live Twitter Wall. Artists will also love all the online attention for their concert. At festivals, people come together. They share memorable moments and experiences together. A Twitter Wall makes that group feeling even stronger, by stimulating interactivity. It makes tweets visible, and in this way stimulates people to talk and comment on each others tweets. A Twitter wall doesn’t only connect the attendees to each other. It can also connect them to the artists. The possibility of actually receiving a reply, makes tweeting questions and messages to their favorite artists extra appealing. For the organizer, it’s quite a challenge to communicate a message to all the festival-goers. A Twitter Wall makes that task easier. Important information, like schedule changes, can simply be displayed on your Twitter screen. A Live Twitter Wall at your concert or festival can enhance your event in many ways. The audience and artists will love it. A Twitter Wall will increase audience engagement and interactivity and help to build a strong community, that won’t want to miss out on the festival’s next edition.